One of the major goals of this blog is to live a story worth writing about. That involves quite a few different adventures and experiences. A few months ago I spent 8 days in the country of Jordan – here’s one of the adventures I had there. Wadi Rum might be one of my favorite places on earth. Over the course of 24 hours, we went on a jeep tour throughout the desert, went skydiving on mars. On our way back to the desert waiting tent where we waited for our skydiving videos to be processed, we passed about 20 atvs parked next to the side of the building. They piqued my curiousity and considering we had some time to kill, I started poking around trying to find more information about the atvs at the various buildings and tents in the area. Then I did something really radical: I asked. As it turned out, the atvs only cost $35/hour and conveniently, we had just about that much time before our skydiving videos were ready. Sean and I looked at each other and nodded. Another good choice. A few minutes later we jumped on the atvs, strapped on our helmets and went after it. 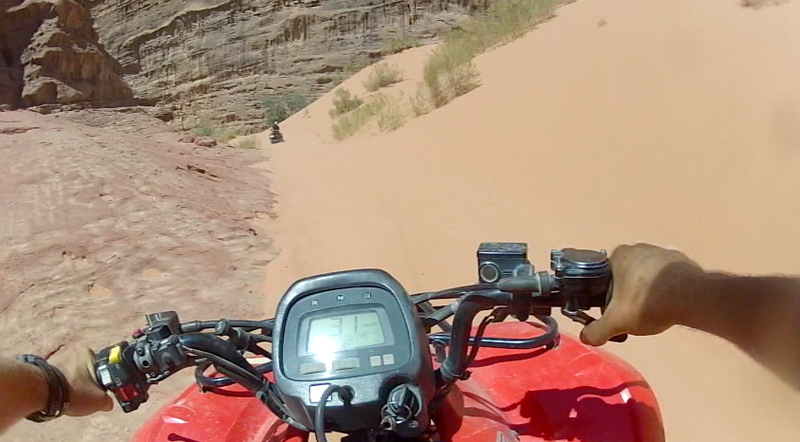 The next hour we spent cruising through rock formations and bombing down sand dunes. It was amazing – I could spend a few thousand words talking about the entire experience, but instead I strapped a GoPro to my chest to give you a first-hand look of what it was like. The ATV adventure was the biggest surprise of the trip. And yes, it was as awesome as it looked (probably even more so). Between skydiving on the moon and ATVing across the desert, Wadi Rum might be my favorite adventure destination on earth.